Watch Shadowhunters Season 1 full episodes online, free and paid options via our partners and affiliates. On Shadowhunters Season 1 Episode 13, Jace makes finding Valentine his number one priority, while Clary and Izzy search for the Book of the White. On Shadowhunters Season 1 Episode 12, Alec and Lydia prepare to be married while Jace, Magnus, and Clary search for the warlock to break Jocelyn's spell. On Shadowhunters Season 1 Episode 11, Clary, Jace, and Luke receive information about Valentine's whereabouts and devise a plan to rescue Jocelyn. On Shadowhunters Season 1 Episode 10, Clary tries to find Valentine through a portal in another dimension where life is everything she's always dreamed. On Shadowhunters Season 1 Episode 9, the Institute and the Clave are on high alert after the attacks, but Jace, Clary, and Isabelle have other plans. 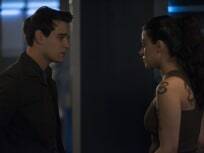 On Shadowhunters Season 1 Episode 8, Clary has to make a difficult decision regarding Simon, while the Lightwoods must face an envoy from the Clave. On Shadowhunters Season 1 Episode 7, Clary and the other shadowhunters race to get the Mortal Cup from its hiding place before anyone else does. On Shadowhunters Season 1 Episode 6, Valentine's story is revealed in hopes of triggering Clary's memory of what happened to The Mortal Cup. On Shadowhunters Season 1 Episode 5, tensions escalate between Alec and Clary when they don't agree on the best way to hunt down Valentine. On Shadowhunters Season 1 Episode 2, after getting a clue about who may have wiped Clary's memories, the crew hunts down Magnus Bane for answers. On Shadowhunters Season 1 Episode 3, Clary, Jace, Alec, and Isabelle work together to rescue Simon from the vampire's lair at Hotel du Mort. "The Descent Into Hell is Easy"
On Shadowhunters Season 1 Episode 2, knowing that Valentine is alive, Jace realizes that Clary’s memories are the key to finding Jocelyn and The Mortal Cup. On Shadowhunters Season 1 Episode 1, a woman discovers that she is from a long line of human-angel hybrids who hunt demons known as Shadowhunters. It's your 18th birthday. Everything's going to change for you now. Permalink: It's your 18th birthday. Everything's going to change for you now. Clary: Simon, how could someone as smart and perceptive as you not realize the person sitting right there is in love with you? Simon: I guarantee you I'm not the only smart, perceptive person to make that mistake. Permalink: I guarantee you I'm not the only smart, perceptive person to make that mistake.